Flags hang from the iron structures along the exterior of Hotel de Ville (French name) or City Hall in Old Quebec in Quebec City, Canada. Cobblestone paths lead around City Hall where beautiful flower gardens are tended to and blossom in an array of colors during the spring and summer. Built in a "Second Empire" style between 1872 and 1878, City Hall or Hotel de Ville is located along the Rue Notre-Dame in Old Quebec, Canada in the oldest area of the city. A fire in 1922, destroyed the interior of City Hall but it was reconstructed around the shell which remained standing and a new modern roof of copper was put in place. Picture of the exterior of the Hotel de Ville in Old Quebec in Quebec, Canada. 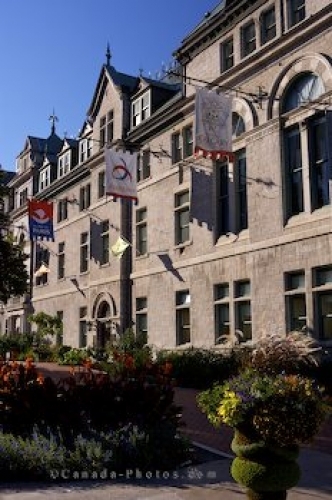 Hotel de Ville, City Hall, in Old Quebec, Quebec City, Quebec, Canada. UNESCO World Heritage Site.